The Catfish Pro is designed for big fish, big water and bigtime fishermen. 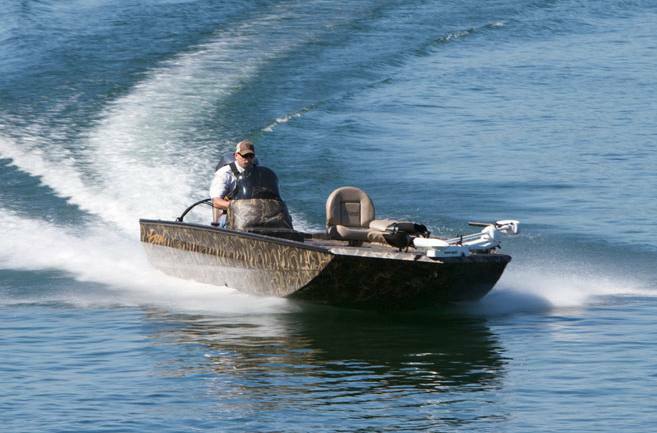 The Viper™ hull turns flat and tight with the versatility to take on the “Big Muddy” or slip into shallow coves only inches deep. 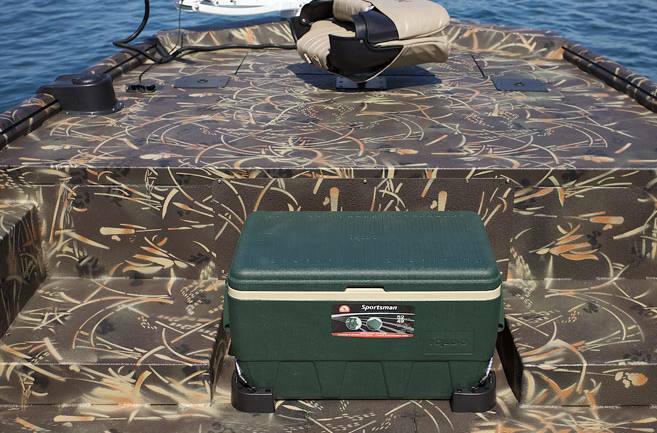 The Catfish Pro is tournament ready with a spacious 66 gallon livewell, 30 gallon fuel tank, comfortable bucket seats and even a 48 quart cooler. 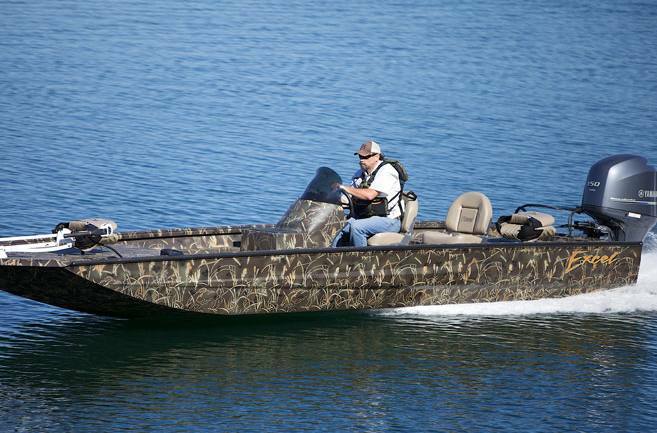 The Catfish Pro’s features are ideal for big water duck hunting and any situation needing a big boat for big water. Transom Height: 20 in. & 25 in. 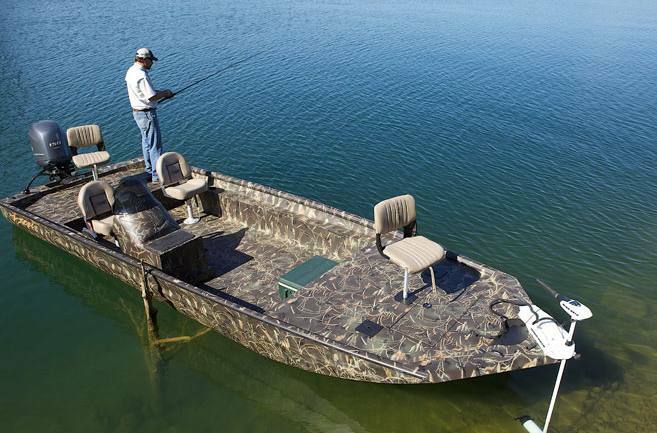 The Catfish Pro viper style hull with reverse chine gets on step quickly, rides smoothly and turns like it is on rails. 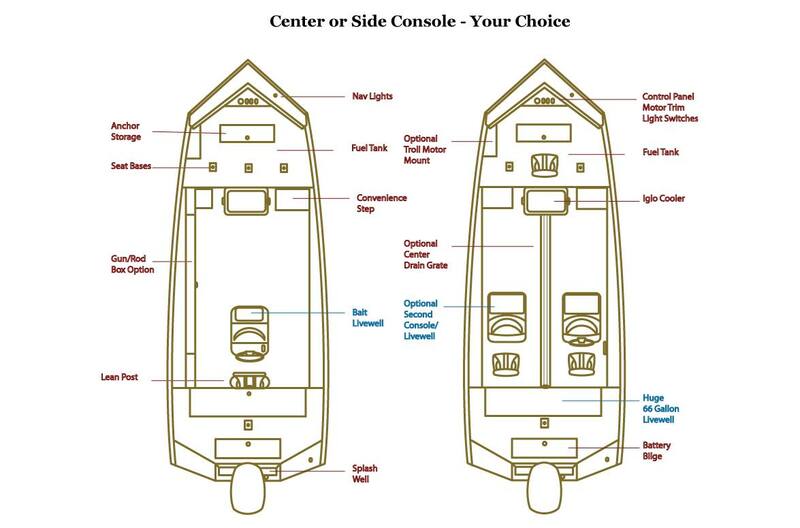 Super Large Livewell: When we say our Excel boats have all the right features - in all the right places, we mean it. 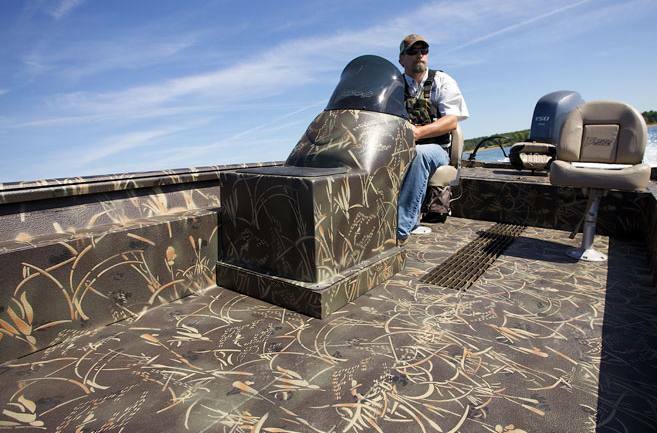 This livewell is big - large enough for any fish we catch. Water Resistant Boxes: All our water resistant storage boxes have a raised edge on top of the box that fits into the cover. This feature prevents normal rainfall and water splashes from getting into the sealed box below. However, be careful at carwashes where high pressure spray can seep up and over the water resistant seal. 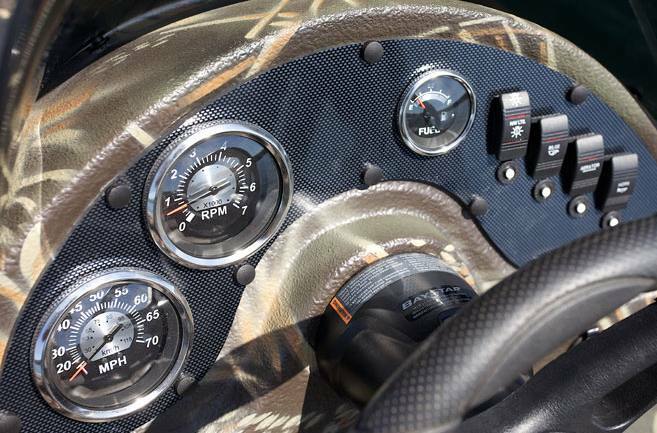 This feature is a premium standard feature on all Excel brand boats. LED Headlight Option: These 5800 Lumen twin LED tough headlights will show you the way through open marshes of the midwest or the timber of Arkansas. 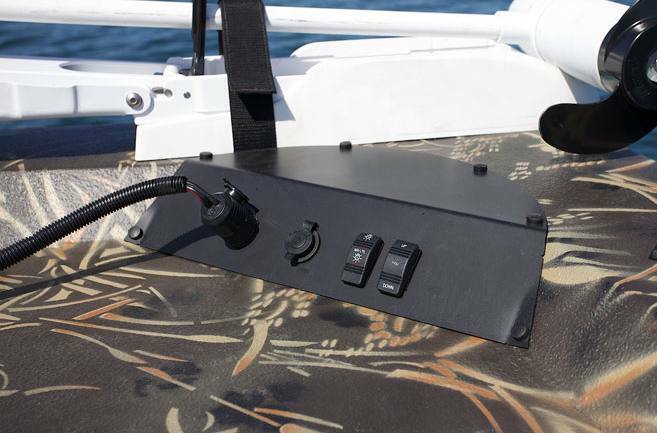 The lights can be adjusted upwards/downwards as needed, and the base swivels around for backing the boat up or any direction you want to put out your decoys out. Shock absorbing hold downs help protect the light assembly when going through brush and timber. The headlight is operated on/off from the drivers panel accessory switch shown above. Center Drain Grate: Keeping a boat clean is one of the biggest challenges we as catfishermen have. 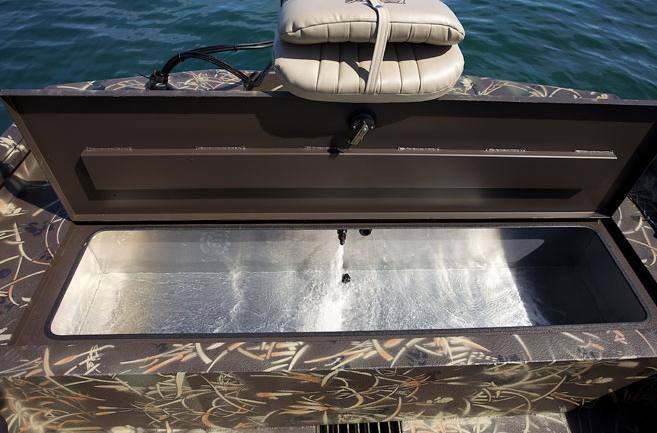 Excel's exclusive center floor grate makes washing down your boat simple. Water flows easily through the grate to the bilge area for easy pumping or draining. Scales, mud, grime are all gone in minutes.